Feb. 9, 2009, 12:45 p.m.
E-readers: Why won’t the future hurry up and get here already? By Edward J. Delaney Feb. 9, 2009, 12:45 p.m.
Today was a day for dueling e-book readers. Amazon just announced its update to the Kindle, which is significantly sexier than its predecessor (although, at $359, it’s no less reasonably priced). And market newcomer Plastic Logic announced its first content partners for its larger-screened device, which include USA Today and the Financial Times. We’ve been hearing for years now that the future of news distribution was in portable e-paper devices. And while news on Kindles or similar gadgets is still a very small niche, there is some real momentum gathering in the news business’ big sister, book publishing. I spoke recently with Russ Wilcox, the CEO and president of E-Ink — the Cambridge company behind a lot of the sector’s technology. He said that it made sense to introduce the tech through book readers. Because earlier displays required a second to reload, that lag imitated the time it took to turn a books page and could have been frustrating with the back-and-forth that comes with reading multiple news stories. And those devices’ text-only environment were a decent facsimile of the book-reading experience. On a Kindle-like device, eventually, ads and content could be packaged in a way that doesn’t leave the advertising skipped over, as it often is on the web. And it could push people to think of their news consumption as part of a package deal again — thinking of The New York Times as a packaged good, rather than as a random conglomeration of articles your brother can email you links to. Second, it’s a possible route to getting readers to pay for the news again. 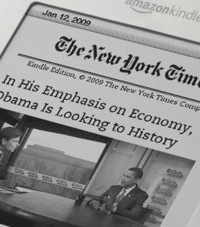 As we reported in November, the Times has more than 10,000 subscribers on the Kindle, each paying $13.99 a month — even though all that content is available for free on the Times’ web site. That’s the beginning of a revenue stream lots of newspapers would love to have. And it could help solve the portability issue. Not everybody spends all day sitting in front of a computer at work, and for many, the portability of the print newspaper package is a big plus. So after a decade-plus of hype, what can we reasonably expect from the e-paper world in the next year or two? — Color. E-Ink and other e-paper manufacturers will likely get color displays to market in 2010, Wilcox said — something that could help with a potential advertising model. — More powerful displays. In 2009 E-Ink will introduce a display that diminishes the delay time the comes from moving from one page to the next on e-paper systems. (The new Kindle promises page turns 20 percent faster than the old one.) There’ll also be larger displays than currently available, likely in plastic rather than glass. — Flexibility. At Arizona State University’s Flexible Display Center, researchers recently introduced a display that flexes easily and is durable. What’s still still unclear is how big the market penetration will be for devices like these. Three or four hundred dollars is still a significant price for most people. Wilcox wonders whether the move by a number of universities to equip its students with e-readers might lead to a pipeline that journalism organizations can exploit. And he suggests advertisers could some day subsidize the cost of getting devices in people’s hands more cheaply. But nearly everyone has a cell phone and a computer — we’ll have to see whether the Kindle or its kind can make a significant dent in those devices, or whether we’ll be waiting another decade or so for “the future” to kick in. POSTED Feb. 9, 2009, 12:45 p.m.
Delaney, Edward J.. "E-readers: Why won’t the future hurry up and get here already?." Nieman Journalism Lab. Nieman Foundation for Journalism at Harvard, 9 Feb. 2009. Web. 19 Apr. 2019. Delaney, Edward J.. "E-readers: Why won’t the future hurry up and get here already?." Nieman Journalism Lab. Last modified February 9, 2009. Accessed April 19, 2019. https://www.niemanlab.org/2009/02/e-readers-why-wont-the-future-hurry-up-and-get-here-already/. | title = E-readers: Why won’t the future hurry up and get here already?